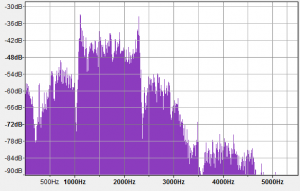 This article shows how to analyse 1200Bd AFSK FM signals off-air to identify defects in setup that will degrade system performance, and the shared channel generally. AFSK as used for APRS can be though of as keying between two tones, 1200Hz and 2200Hz. The keying does create other products, but the two frequencies are very evident in waveform displays as shown in this article. The method used here is to record audio output from a normal FM receiver. These receivers are designed to use de-emphasis, and it must not be bypassed or disabled in these tests. In fact, for the receiver used here (an IC-2200H), it has been determined by test that its de-emphasis is not ideal in that it reduces the 2200Hz tone 1.2dB (or 13% voltage) more than it should (relative to 1200Hz). For the purpose of illustration, the free audio package Audacity has been used. Above are three transmissions, the first from a strong mobile carefully set for 3kHz deviation at 2.2kHz modulating frequency, and two nearby digipeaters. or click APRS01.mp3 to download the file and analyse it yourself. Note the apparent difference in the first half of the right hand transmission. Zooming in on that, the different pattern is the preamble during which the transmitter sends a series of 0x7e HDLC frame codes, the last of which denotes the start of the AX.25 frame. In fact the selected preamble starts way off left of the clip, and its duration is given in the bottom of the window as 337ms. This is excessive, it wastes channel time. By contrast, above is the middle transmission which has a very short preamble of just 71ms of which the last 21ms is frame codes. This is a less common setup, most transmitters will be sending frame code from the moment they produce RF, but it illustrates that the important parameter is the time from key up to completion of the last frame code. Above, the total time before frame headers are send is 70ms. This gives adequate time for the receiver mute to open and the modem to decode the start of the AX.25 frame. Above is the preamble of the first transmission. It sends frame codes from the moment the RF appears, and the duration is 66ms. Note that this is from the receiver, and is 66ms additional to the time for this receiver’s mute to open. This preamble time is often controlled by the TNC parameter TxDelay, and a value that is comfortably long enough for the slowest receivers to open mute is adequate, more is a waste of channel time. 100ms is a good starting point. too little audio drive reduces S/N ratio at the distant receiver and can reduce success in decoding weaker signals. Above is a spectrum plot from Audacity. 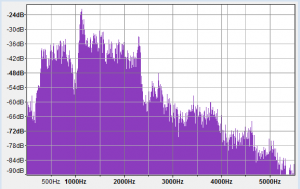 Note the slope over the range 1.2-2.2kHz, something more than 10dB. There should be negligible slope or twist as it is known, the modem chips used are designed to work on telephone lines which are relatively flat over that range, and twist degrades their performance. Above, the first signal which has much lower twist and you will note much lower distortion products outside of the 1.0 -2.4kHz range. Tx audio eventually modulates the RF signal, in FM the variation in instantaneous signal frequency is known as deviation. Usable deviation is limited by the distant receiver’s bandwidth, but a more common constraint is the peak limiter typically used in the transmitter. The limiter is usually used after the pre-emphasis circuit and it limits deviation typically to something less than 4kHz, often as low as 3.5kHz in a factory configured radio. Since the AFSK signal spectrum contains energy up to about 2.5kHz, a maximum deviation of 3.5kHz at 2.5kHz modulating frequency implies 3.1kHz at 2.2kHz due to pre-emphasis, lets round it to 3.0 kHz deviation at 2.2kHz modulating frequency, and 1.6kHz deviation at 1.2kHz modulating frequency. There are lots of procedures around for setting audio drive without a deviation meter, but the observation that almost all station are grossly overdriven stands as testament to the failure of these methods. both the high and low tones, and while listening on the receiver, press the 1 and 2 keys to adjust the transmit audio level. You should start the level high, and then bring it down until you hear a noticeable level drop on the receiver. You can also use the R1 pot on the TT4 PCB to adjust the transmit audio level. In fact any limiting means a reduction in pre-emphasis and this method will lead to adjusting the level down to the point just below that at which the low tone is limited, but where the high tone is still limited by almost 5dB. It does not achieve the objective of no limiting. Hook up the TNC to the radio, set the radio to low power and (ideally) connect the antenna jack to a dummy load. Tune the second receiver to the same frequency and remove the antenna; ideally, also connect its antenna jack to a dummy load (the idea is to keep the receiver from being overloaded by the transmitter’s signal). At the command prompt, enter CAL. Press K to key the transmitter. (The TNC’s timeout timer may limit the keyup time to ten seconds or so; if the transmitter cuts out before you’re finished, unkey and then key again. Press the space bar to toggle between tones until you hear the high tone in the receiver’s speaker. When finished, press K again to unkey the transmitter, and Q to quit the calibration routine. Make sure that the TNC is sending the high tone. Increase the TNC’s TX Audio potentiometer (the instruction manual will tell you where it is) until the tone you hear in the receiver doesn’t get any louder — which indicates that the transmitter is clipping — and then bring it back down again until you hear the tone get noticeably softer. Turn the pot down a little bit more for good measure, and then toggle the tones to make sure that both are still coming through. It’s better to have the deviation a little too low, than too high. In most but not all cases, it is the limiting threshold that limits usable deviation. The objective here is to set the drive so that the high tone does not suffer any limiting, so it should be adjusted up to the point of first indication of limiting (rather than until the tone you hear in the receiver doesn’t get any louder) and then backed off a little. This is the worst thing you can do because as stated earlier, most stations are overdriven. Above is a snippet of each of the three transmissions discussed earlier. Let’s focus on the voltage obtained at the low frequency tone and compare them. The first signal has been calibrated to 1.6kHz deviation, the second transmission has deviation of 5.0kHz for the low tone, and the third has deviation of 3.2kHz for the low tone. These levels suggest the limiter threshold in the transmitter is at least 5.0kHz and 3.2kHz respectively for those transmitters. The middle transmitter has an unusually high limiter threshold, possibly the result of uninformed dabbling with mic gain and deviation controls and might properly be regarded as quite atypical of these radios. Defects in APRS AFSK transmissions can be discovered by analysing an audio recording taken with an ordinary FM receiver of the type used to decode the transmissions. Low deviation degrades decoding, but not nearly as much as excessive audio drive. Notwithstanding that, transmitter audio overdrive is the most common defect, and it can make even strong signals impossible to decode. ‘All knobs to the right’ is not an appropriate lineup method. ‘Infrastructure’ stations such a club digis are not necessarily good configuration examples. With experience, you will recognise the characteristic sound of some common defects. Fixing defects improves the probability that your APRS transmissions are decoded, and hence the position reports recorded.